The stock market has been a rumble and tumble entity through November and investors are taking note. Between Nov. 19 and Nov. 21, as the country prepared for Thanksgiving, the Dow Jones Industrial Average slipped from 25,392 to 24,464, a loss of almost 900 points. The Friday after Thanksgiving, it dropped another 200 points. The week following Thanksgiving saw the Dow regain almost all of those points and it closed over 25,000 once again. Everything that could be blamed did get blamed. Mid-term election results, relations with Saudi Arabia, relations with China, relations with Mexico, earnings reports for key corporations, the federal benchmark interest rate – they all got a nod as a factor in the topsy-turvy stock market in November. The fluctuations caught the attention of investors who take part in the monthly Spectrem Confidence Index survey. 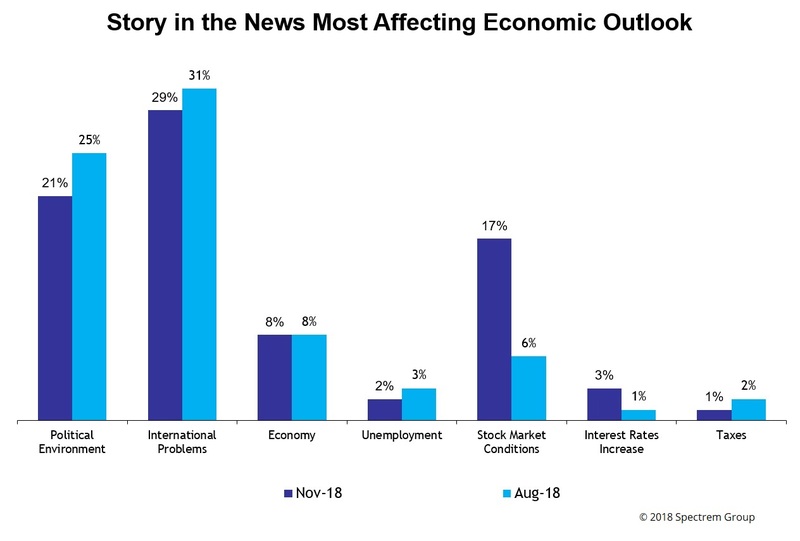 Each month, the survey asks one pointed question about current events, and in November the question was What story in the news is most affecting your economic outlook? The most popular answer was “international problems”, which 29 percent of respondents chose. But the answer gaining the most ground among investors was “stock market conditions”, which garnered 17 percent of the selections. In between was “the political environment”, which gained 21 percent of the vote. Those three answers earned two-thirds of all selections, and “stock market conditions” gained 9 percent from the last time the question was asked in August 2018. The rise came as those answering “political environment” and “international problems” dropped by a few percentage points. The only other response to gain any significant percentage of selections was “the economy” with 8 percent. The question gets scattered responses over time. One year ago, in November of 2017, 42 percent of respondents said “taxes” was their No. 1 concern. Two years ago, 83 percent said “the political environment” was the root cause of economic issues. It is noteworthy that while 17 percent of investors with $500,000 in investable assets see “the stock market” as the No. 1 concern, only 11 percent of millionaires with at least $1 million in investable assets agree. The millionaires are more likely to complain about the political environment (26 percent to 21 percent).